Today with this new laser, surgery is much more precise and extremely fast. 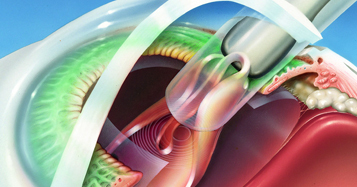 In effect, the laser is guided with an OCT (ocular coherence tomography), the surgeon receives in his optical microscope all data and shooting screens allowing immediate adjustment. * The corneal incisions obtained by the laser is very precise and predictable. * The opening of the anterior capsule (capsulorexis) is circular, regular, accurate and reproducible, this is paramount. Indeed, this contributes to the stability of the implant which replaces the crystalline lens. * The fragmentation of the nucleus cloudy lens (cataract) into pieces (which was before with ultrasound) .L’énergie laser is focused and less dispersive than the mechanical vibrations generated by the vibrating head phacoemulsificator frequency of ultrasound.